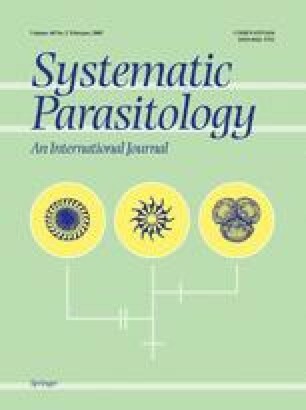 Transmission of Leucochloridium species to their definitive avian hosts may be facilitated by the rhythmic movement of coloured sporocyst broodsacs in the ocular tentacles of infected snails. These broodsacs resemble caterpillars and by enticement increase the probability of predation by birds. Broodsac banding pattern and colour (green, yellow to red/brown) have traditionally formed part of the taxonomic criteria for the genus. In this study, sequence divergence of the 5.8S rDNA gene and associated internal transcribed spacers (ITS1 and ITS2) in two of the most frequently observed Leucochloridium taxa from Europe is related to broodsac type based on colour and banding pattern. The present green-banded broodsac (L. paradoxum Carus, 1835) and brown-banded broodsac forms (L. variae McIntosh, 1932) differ in ITS sequence by 6.8%, confirming their distinctness. No intraspecific differences were noted within each colour morph in specimens collected from Poland, Denmark or Norway, indicating that a single taxon of each type occurs in Europe. The significance of these findings to our understanding of metapopulation dynamics and evolutionary ecology of Leucochloridium is discussed.